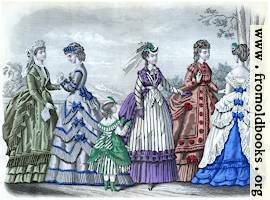 Godey’s Lady’s Book was the most popular magazine for women published in America in the 1860s and 1870s; it started in 1830 and continued to 1898. I have 1870, bound in one volume, althouth it was issued to be collected into two parts originally. The images here are from the first part. The magazine includes a fold-out coloured plate showing the latest fashions, usually for women and children, and with some instructions and diagrams for making the clothing. The volume I have was edited by Mrs. Sarah J. Hale alongside the founder, Lous A. Godey (1804 – 1878). Sarah Hale is also known for a song she wrote, Mary Had a Little Lamb. I got this book at Berry and Peterson books in Kingston, Ontario, Feb. 2018. Editor: Hale, Sarah J., Mrs., and Godey, Louis A.